Western blot analysis of extracts from COS cells transfected with the indicated amounts of human FGF receptor 1, using FGF Receptor 1 Antibody. 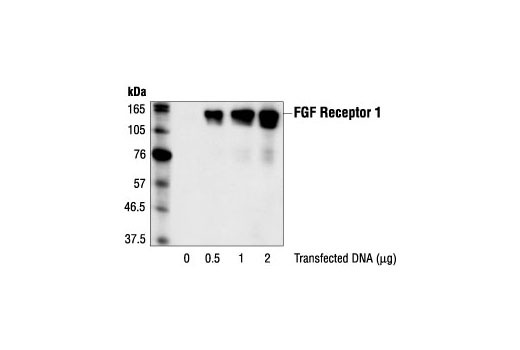 FGF Receptor 1 Antibody detects transfected levels of FGF receptor 1. It does not cross-react with other FGF receptor family members. Polyclonal antibodies are produced by immunizing animals with a synthetic peptide corresponding to the amino-terminal residues of human FGF receptor 1. Antibodies are purified by protein A and peptide affinity chrmatography. Fibroblast growth factors (FGFs) produce mitogenic and angiogenic effects in target cells by signaling through cell surface receptor tyrosine kinases. There are four members of the FGF receptor family: FGFR1 (flg), FGFR2 (bek, KGFR), FGFR3, and FGFR4. Each receptor contains an extracellular ligand binding domain, a transmembrane domain, and a cytoplasmic kinase domain (1). Following ligand binding and dimerization, the receptors are phosphorylated at specific tyrosine residues (2). Seven tyrosine residues in the cytoplasmic tail of FGFR1 can be phosphorylated: Tyr463, 583, 585, 653, 654, 730, and 766. Tyr653 and Tyr654 are important for catalytic activity of activated FGFR and are essential for signaling (3). The other phosphorylated tyrosine residues may provide docking sites for downstream signaling components such as Crk and PLCγ (4,5). Reilly, J.F. et al. (2000) J Biol Chem 275, 7771-8. Mohammadi, M. et al. (1996) Mol Cell Biol 16, 977-89. Mohammadi, M. et al. (1991) Mol Cell Biol 11, 5068-78. Larsson, H. et al. (1999) J Biol Chem 274, 25726-34.